APMG LAUNCHES ZOMBIE SERIES COLLEGE OF THE DEAD ! College of the Dead is a horrific graphic novel series, a gruesome cross between The Walking Dead and Breaking Bad; set on a college campus. Russian-born Professor Rosa Demikov teaches students by day and sells them drugs at night. Her clandestine operation is jeopardized just as the undead rise in the collegiate town to feast upon innocent students… and anyone else with living brain tissue! Holed up in the Science Building as zombies assault the college, Demikov must use her wits-as well as her unsuspecting students-to protect her operation and plan her escape. 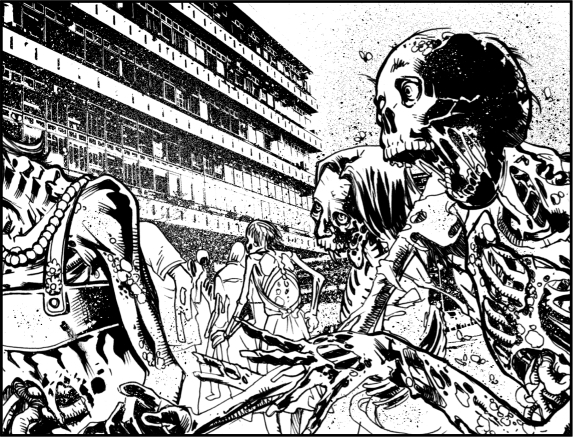 Hoards of zombies begin take over the college on their way to destroying the world. Twitter account blasts past 21,000 followers! Our Twittter account, @500ThingsMyCatT has just gone past 21,000 followers! EMAILS FROM MY CAT HITS BOOKSTORES! 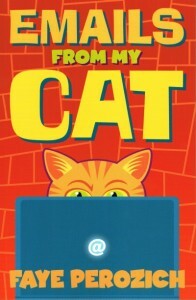 An all new hilarious book, straight from your cat’s email address! I knew that my cat, Fluffy, was using my computer. What I didn’t know was that Fluffy had gotten his own screen name! The emails started to fly. This is a collection of some of my favorite emails from (and to!) Fluffy. Here you’ll find what I found — humor, curiosity, and even the occasional feline chain letter — written with love and laughter by a wonderful and highly-motivated cat! I still don’t have a clue how he types with those paws, though…. 500 THINGS MY DOG TOLD ME NOW IN BOOKSTORES! Your dog looks at you. An eyebrow goes up. You know there’s something going on in that furry little mind – ever wonder what? 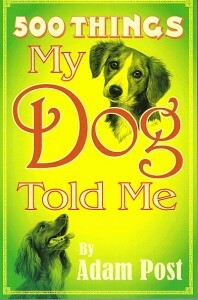 Well, here are five hundred insights into the mysteries of your dog’s thoughts – straight from the canine’s mouth! If you’ve ever been curious about what that strange tail wag means – or what your dog is really thinking when he tears up your house while you’re out – this is your source for tender, touching, and totally outrageous answers! You may never look at your dog the same way again! 500 THINGS MY HORSE TOLD ME GALLOPS INTO YOUR BOOKSTORE! 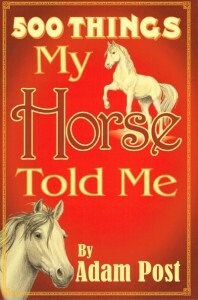 A Must Read For Every Horse Lover! Horses have been an essential part of people’s lives since before the Roman Empire — and of course they still are today. But have we ever really listened to what our horses have been trying to tell us? Ever wonder what a horse is trying to tell you? Straight from the horse’s mouth, you get 500 direct quotes from a horse with wit, wisdom, and an exceptional outlook on life — yours and theirs! • To ride on a horse is to fly without wings. • Do I come to your house and sit on you? • The hardest thing to do on a horse is nothing at all. • Excuse me… you put the cart in front of me again. • Horses are passion with hooves. This amazing book is a MUST HAVE for all horse lovers and makes an excellent one-of-a-kind gift! Don’t miss this opportunity to get a piece of horse history! 500 THINGS MY PENGUIN TOLD ME ..WADDLES ITS WAY TO YOUR BOOKSTORE! They balance eggs on their feet and they’ve all been fitted for tiny tuxedos. But what do penguins really think about? If you’ve ever wondered what might be flitting through the minds of these feathered, flightless waterfowl, here are five hundred hints – straight from the penguin’s beak! Enlightening, entertaining, and often downright silly, you’re about to enter the mind of a loquacious penguin…and you just may have too much fun to leave! 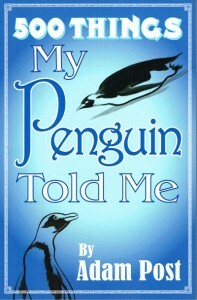 This amazing book is a MUST HAVE for all penguin lovers and makes an excellent one-of-a-kind gift! Don’t miss this opportunity to get a piece of penguin history! • Man, are my feet cold! • I don’t care what Bugs Bunny says – penguins is not practically chickens! • I’m not fat – I’m retaining blubber. 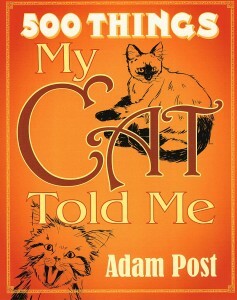 500 THINGS MY CAT TOLD ME EXPANDED EDITION RELEASED! DELUXE EXPANDED EDITION WITH OVER 80 MORE PAGES AND 100 NEW CAT ILLUSTRATIONS BY ANDRES LABRADA! Have you ever wondered what your cat was thinking? Have you ever looked into your cat’s eyes, certain that there was some deep thinking going on in there – or maybe just a bit of plotting and scheming? It’s time for a few answers…straight from the cat’s mouth! FIVE HUNDRED THINGS you’ve always wanted to know – but were probably afraid to ask your cat – provide some touching and hilarious insights into what’s going on behind the mysterious eyes of your favorite feline! You’ll never look at your cat in quite the same way again! This amazing book is a MUST HAVE for all cat lovers and makes an excellent one-of-a-kind gift! Don’t miss this opportunity to get a piece of cat history! It is a full 260 pages with over 100 original illustrations by Andres Lambrada. ALREADY A HIT ON TWITTER…. 500thingsmycatt@twitter.com has over 24,000 followers! • The Egyptians worshipped me – why can’t you? • Did I say you could stop petting me? • No – not… the vacuum cleaner! A MUST READ FOR EVERY CAT LOVER! my cat’s first sentence. adam post obviously has cats related to mine. i’ve had cats for more than 50 years (not the same ones, of course!) and this book brought back so many memories i alternated laughing with crying. i see this has been on the best seller list in the uk for over 3 months and is now the top seller. it deserves it!!! one of the best things i’ve ever done for myself was buying this book! thank you adam post! 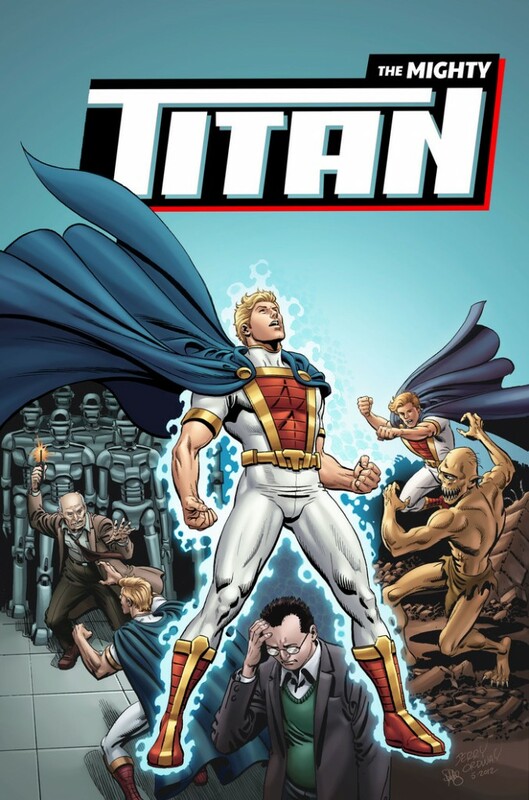 LITTLE FERRY, NJ — Imagine for a moment you are the world’s strongest protector—TITAN, an invincible superhero who cannot be harmed by knife, bullet or bomb. Now, imagine Titan’s mortal, regular-guy alter ego is told he has cancer and is dying. What then? That’s the premise of “The Mighty Titan,” a 5-issue comic book series created by Joe Martino and his publishing company, JGM Comics. Joe knows intimately what it’s like to deal with cancer— he’s been diagnosed and has beaten the disease… twice. Many comic book industry veterans have helped Mr. Martino realize his vision. Issue #1 features a cover by legendary artist Jerry Ordway, colored by Danielle Alexis St Pierre. Other cover art has been created by notables Jamal Igle, John Byrne, Bob McLoed and Phil Jimenez. “The Mighty Titan” also boasts the talent of pencillers Luca Cicchitti and Cory Smith, inker Jeff Austin, colorist Keith J. Betancourt and letterer Johnny Lowe. Make no mistake: even with its themes of vulnerability, loss and hope, “The Mighty Titan” is a fun superhero comic with vile villains, giant mechas and amazing mythological creatures. With just under two weeks to go until his KickStarter campaign ends, Mr. Martino has over 200 backers who have pledged about half his goal of $10,000. As with all KickStarter crowdfunding campaigns, if the total goal amount is not met by the deadline, the project is cancelled and receives no funding. Adam Post Media Group, Inc.
(as reported by Yahoo Finace and Forbes) Adam Post, President and founder of APMG (Adam Post Media Group), a consumer-brand oriented intellectual property business focused on developing new intellectual properties, has been appointed to the Board of Directors of Platinum Studios.